With age comes wisdom and an acceptance that life is finite. As seniors enter their golden years, many reflect on their life and the legacy they wish to leave behind. Many also realize end-of-life costs, especially funerals, can cause a burden for their loved ones. With the best interest of their family and for their own peace of mind, they turn to funeral insurance for seniors. How much funeral insurance coverage do seniors need? What type of funeral insurance can I qualify for given my age, current health condition and any existing pre-conditions? What policy aspects or common traps should I pay attention to? What is the best way to get funeral insurance for seniors? This blog will answer these important questions but first, let’s start with an understanding of what funeral insurance is and what the benefit covers. Introduction: What is Funeral Insurance? It may sound counterintuitive but funeral insurance is actually a life insurance product. While traditional life insurance is designed to help your family with the loss of the deceased’s income, funeral insurance is much more specific. Funeral insurance for seniors covers so called “final expenses” – the casket/cremation costs, the funeral service, travel fees for family flying in, etc. The type of funeral insurance purchased will dictate how the beneficiaries will spend the benefit. A burial insurance plan is only used for final expenses while a guaranteed issue life insurance plan has more flexibility for discretionary spending. Many seniors in poor health make the mistake of not getting funeral insurance because they believe they will not qualify. Simplified and guaranteed issue policies are specifically designed for those that do not qualify for traditional life insurance, so in reality, everyone can get the coverage they need. 1. How Much Funeral Insurance Coverage Do Seniors Need? 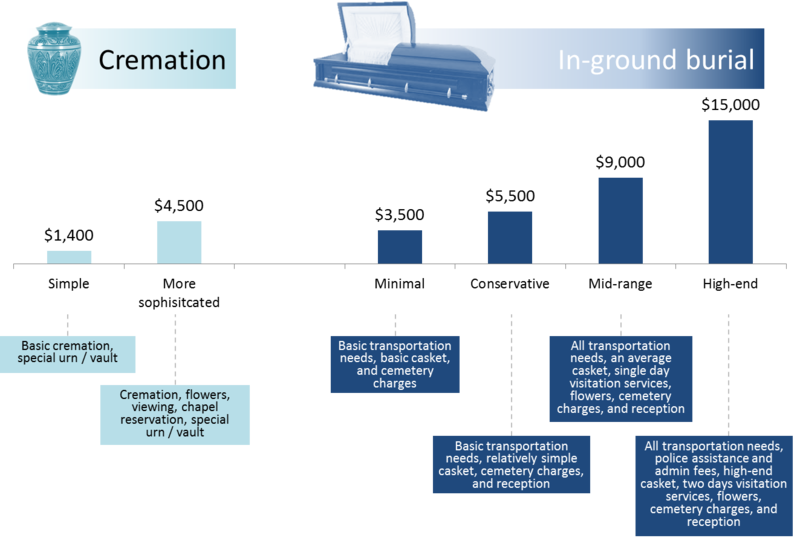 There are many variables that affect the cost of a funeral, such as a casket vs. cremation, the choice of flowers, having a viewing, broadcasting the service for those that cannot fly in and choosing to serve refreshments for the guests. Since the cost can vary greatly depending on these variables, funeral insurance costs vary too. To determine the amount of coverage needed, first plan and price out your preferred funeral. With that cost in mind, you can better select your coverage. One of the largest costs is the interment of the remains. Over 60 per cent of Canadians choose cremation. Cremation typically costs between $1,400 – $4,500. Burials are more expensive. A very basic casket is around $3,500, not including the service or flowers. An average ceremony is around $9,000 and a high-end service can be as high as $15,000 or more. If you are interested in cremation, insurance coverage of $5,000 is appropriate. For burials, coverage of $10,000 – $15,000 is best. 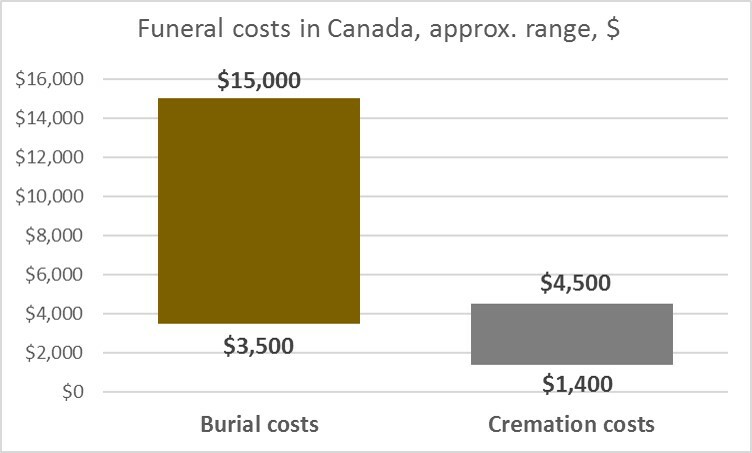 Here is a more detailed overview of funeral costs in Canada. A Toronto Star article provides additional insights about burial and cremation costs in Canada. 2. For What Types of Funeral Insurance Do Seniors Qualify? Due to their advanced age, most seniors automatically reach for a guaranteed issue policy, but many seniors actually qualify for much more affordable coverage. Standard/traditional policy: This is the most affordable and is for “young” seniors in good health. Simplified issue policy: Seniors with health conditions that would result in a rated or denied traditional policy often qualify for simplified issue coverage. This policy has no medical exam, just a few medical questions. People with diabetes, for example, often qualify for a simplified issue policy. Guaranteed issue policy: A guaranteed issue policy is the most expensive of the three, but it is specifically designed to insure those that could not otherwise get coverage. Imagine the stress of having terminal cancer and not being able to get life or funeral insurance. That’s where guaranteed issue comes in. You cannot be denied a guaranteed issue policy, even if you are terminal. The benefit goes a long way in alleviating financial distress. Seniors looking for funeral insurance should speak with a broker. The difference between a broker and an agent is this: a broker can shop for all the different products on your behalf. An agent can only sell the products of one company. Brokers have access to more options and therefore, often, better rates. Brokers get commission on the products they sell, which means their services are free to you. 3. How Much Does Funeral Insurance for Seniors Cost? The price of funeral insurance for seniors depends on the type of funeral desired and the type of policy the senior obtains. To get a ballpark price, we’ll walk through the most expensive option: a guaranteed whole life policy for a burial service. The following numbers are based on Gerber’s life burial plan and are approximations. Actual numbers vary across different providers. Ladies 65 years old in need of funeral insurance coverage for $5,000-$10,000 will pay $30/month – $60/month in premiums. Ladies 75 years old will pay $70/month-$140/month. 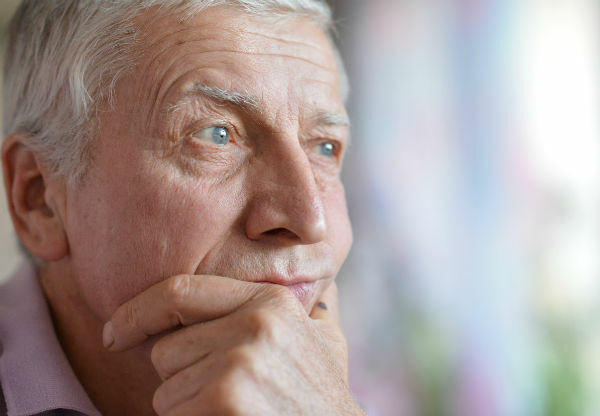 Men 65 years old in need of funeral insurance coverage for $5,000-$10,000 will pay $37/month – $74/month in premiums. Men 75 years old, will pay $55/month-$110/month. Seniors may be eligible for discounts. A broker will help you explore all your coverage and discount options – you can request a free funeral insurance quote today. 4. What policy aspects and possible traps should I pay attention to? As with any contract, there is fine print. Here are some of the things to know before you sign and accept the policy. Ages covered: The general age range for funeral insurance for seniors is between 50 – 80. Be sure to know the age limitations to ensure you are eligible for the policy. Age rounding: The insurer will round your age up or down. Aim for a “down” rounding for the best premium. For example, if you are going to be 65 years old on December 31, buy the policy in the first six months of the year. Your age will be rounded down to 64. Buy later than that and it will be rounded up to 65. Size of coverage: The highest coverage amount of funeral insurance for seniors is $10,000. If you need more or significantly less than that, speak with your broker. They know the best riders and ways to increase or decrease the benefit while getting you the best possible premium. Length of the premium: Planning to live past 100? Most final expense premiums expire after the beneficiary turns 100. Some policies are more flexible on this than others, so be sure to check the length of the premium. Additional protection/riders: Money for funeral expenses is great, but wouldn’t it also be nice to have a lump sum for medical costs if diagnosed with a critical illness? A critical illness rider can be added to funeral insurance for seniors. This is just one of the many helpful riders you should discuss with your broker. Travelling: The golden years are the perfect time to travel, but skip regions that are unsafe. Previous or planned travel to Sudan, Afghanistan, Niger, Honduras, Iraq, Somalia, etc. can get you a rated or declined policy. If you must go to a dangerous area, speak with your broker first. Paying annually and not monthly: Most insurance companies reward seniors that pay an annual lump sum instead of monthly payments. This is because lump sums reduce administration costs. Something to consider if you have the means for annual payments. 5. What is the Best Way to Get Funeral Insurance for Seniors? Captive agent: They are called “captive” because they work for just one insurance company. This agent will have superior knowledge of the company’s products, but if you think there is a better deal elsewhere, he or she will not be able sell you the product of a different company. Broker: Brokers have access to the entire spectrum of insurance products and can shop the market on your behalf to get you the best deal. It may take a little more time than dealing with a captive agent because the broker has to do more research, but the payoff is often a better rate and a policy better specified to your needs. InsurEye will connect you with an expert broker for life and funeral insurance. Our independent brokerage partners provide you with a free quote and all the information you need to make the best purchase for your specific needs. Our broker partners are happy to help and are never pushy. We know the importance of making informed decisions, especially about end-of-life needs, so please visit our website today for the outstanding customer service and dignity you deserve as you make the important choice to obtain the protection of funeral insurance.